Congratulations to Yamaha (and teammates Pol Espargaro, Bradley Smith and Katsuyuki Nakasuga) for breaking Honda’s string of victories at the Suzuki 8 Hours yesterday. For us, there is an even bigger story coming out of this race. Imagine this — you convince your retired MotoGP star (a company “VIP” so important you would not allow him to replace Dani Pedrosa in Texas this year, because you wanted to make sure he first had a podium-worthy set-up) to race the Suzuka 8 Hours on a modified superbike, and then he crashes and suffers significant injury due to a problem with the bike. 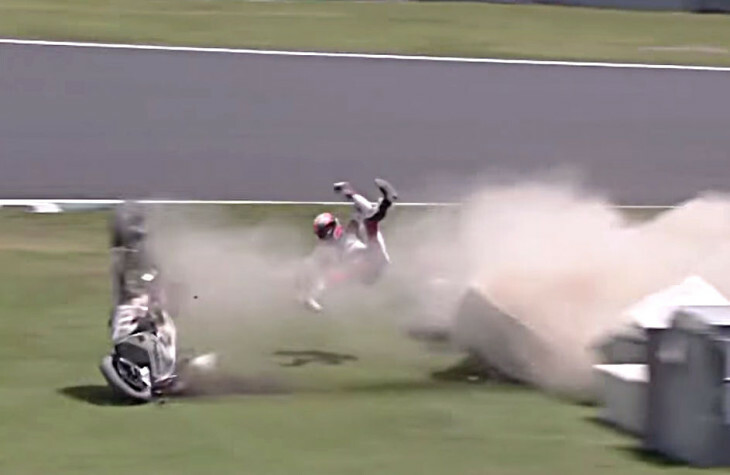 This is what happened to Honda and Casey Stoner at the Suzuka 8 Hours. Although the injuries do not appear to be career-ending, you have to wonder whether Stoner, already reluctant to take racing risks following his retirement, will ever compete in MotoGP again, or even continue his role as a MotoGP test rider for Honda. To call this a PR nightmare for Honda is a gross understatement. With the complexity of modern racing computer-controlled systems (Stoner’s throttle was surely a ride-by-wire affair), I suppose it is surprising that these sort of things do not happen more often, but it is hard to imagine a more embarrassing outcome for Honda. He had the clutch pulled in quite a while before the tuck. Appears to have been a throttle issue. When’s the last time you went fast into a corner and pulled in the clutch when entering the apex? Doesn’t happen. The quickest way to disconnect a revving motor from the trans and running gear – pull in the clutch. He did pull in the clutch and then panicked..All he had to do was pull in the clutch and ride it out across the track instead the front end tucked and the rest is history.. He could of done better.. Frankly, Honda have had a pretty dodgy year in motorsport overall, both on two and four wheels. Grossly under-performing F1 engine, flawed MotoGP chassis causing them to revert to MM93’s current “hybrid” setup, the Nick Wirth’s CFD failure with their Indycar engines, scrapped Le Mans project, this Suzuka nightmare. As they say, just like bananas, problems come in bunches. I am not a huge Stoner fan but I do respect his abilities and I am not about to second guess whether he thought he could make that turn or not. He clearly decided that he could not make the turn and then took what he thought was the safest route. Note there is not a lot of runoff area in that turn so his options were limited. Throttle sticking in a ride by wire era can be caused by the throttle twist grip jamming or a failed sensor but usually this type of error is caused by a software issue of some sort. This is something that scares me about ride by wire technologies when some combination of inputs to the ECU causes an error and you end up with a stock throttle or something similar. I also realize this is a fear of technology I do not fully understand too. The GP and superbike racers trust their lives to the technology so it is usually pretty damned reliable but any system can fail. I take Casey’s explanation at face value and see no reason to doubt him as he is much more qualified than I am to judge what happened in that corner on that bike at that time. He’d been riding the bike and track for a couple of weeks… So he undoubtedly had a good feel of it all. To me….. CLEARLY there was an issue here “other” than rider error. The sad part is, I would think this would put the lid on any chances he comes out of retirement in MotoGP. i’m sorry, but the Japanese announcer is better than anyone who’s ever done colour commentary for World Cup. “So I decided to lay it over” – I don’t care who you are, that is always bull crap. Hearing this from Stoner…sigh. And those that want to defend it, let’s hear your cow-tipping stories while we’re at it…. Tim C…you’re an idiot !! Yes, Tim C. is an idiot. There’s been a few time I’ve had to lay her down or get hurt whether Tim wants to believe it or not. I used to road race too, but was never a Casey Stoner. I do know when my options are few, however. I’ve seen countless racers ditch a bike upon seeing a wall ahead. You should go daown undah sometoim Tem and av a go at maykin ya staytmint in front of some ah the guys mate! I’m not some #27 fanboy…but honestly, you think a two-time world champion, and someone universally regarded as one of the most talented riders in the history of the sport, would make up a lame story about something like this? Look at his lean angle coming into the corner. He’s not exactly dragging a knee. You think he couldn’t have banked it over further and attempted to keep it on the track if he’d wanted? Looks to me like he realized that wasn’t gonna work and essentially let it run off (knowing he was going to crash) where he thought he had a relatively clear path…hence the “lay it over.” The front end tucked as it ran off the pavement. The alternative would have been trying to force it around a turn he was going too fast for and crashing at an unknown angle. I don’t doubt that, under the circumstances, he chose what appeared to be the lesser of two evils. Look where he was on the track, the longer he could hold his line the better off he would have been. He pulled the clutch, could very well have been a mechanical issue but I think he may have fixated a bit. I think he could have done more. Mentally he just isn’t the guy he was a few years ago and it’s probably better for him to just let it be. Brakes stop better than sliding plastic etc. And as far as my idiocy goes, I guess me and Bill are in the dunce corner, but nice one Bill. Brakes don’t work against throttle.With power on, less weight would transfer forward and then the front would tuck, about like it did. Brakes also don’t work when the bike leaves the pavement. If Stoner says he decided to lay it down, then that’s what happened. If he had stayed on the bike, he would’ve had even less run-off in the next turn. He admits to misjudging how solid the barrier blocks were. – I do not think he had time to lay it down even if he intended to do it on purpose. It looks to me like he ran out of track and when the front wheel went off the edge it washed out and he was down whether he intended to or not. My personal opinion is still that he didn’t have time to make this a conscious decision. The internet is an easy place to call people idiots, so feel free – I have a thick skin but this is still how I see it. He sure didn’t have time to figure out how not to lay it down. I think he did decide to laymit down by simply deciding not to try and hold the line and keep it on the tarmac. I’m not going to second guess a guy with riding talent I’ll never understand. I don’t agree with or appreciate the “TimC is an idiot” comments, so please don’t group me in with those guys. Of course I can’t say for sure he didn’t make a mistake there, but it is my opinion that a rider of his caliber would have well been able to gauge whether or not he could somehow salvage that situation. These guys charge hard and brake late, so I would think the time between when he realized there was a problem and the time he had to make a decision about what could be done about it was very small. It looked like he maintained lean as long as he could to get himself as parallel to the wall as possible. He clearly was following the race line and knew good and well – just as anyone watching – that the front would tuck as soon as it left the tarmac. So it looked like a planned get-off from my perspective. Meant to say “wasn’t” following the race line. 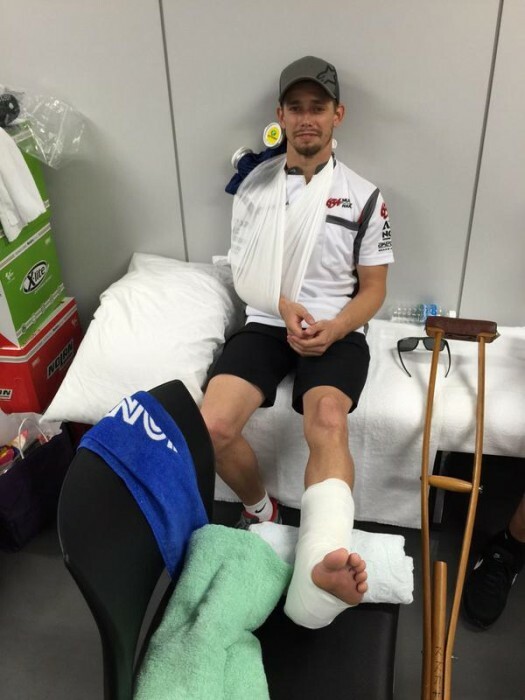 Is the nightmare worse for Honda or Casey Stoner and his family? Me thinks the latter. I’m having trouble figuring this out based on the video footage. At 0.04 on the entrance to the corner Stone seems to already have pulled in the clutch, goes close to the apex, then as he exits the corner is still covering/on the clutch and heading for the outside of the corner. He seems to not be looking far through the turn. If the throttle did stick, was he not able to fully apply the clutch (he seems to already be covering it) in time to neutralize the engine, or did the clutch not activate due to the seamless transmission electronics? How can you have a stuck throttle with a fly-by-wire system? From the video, it clearly looks like Casey put the front tire off of the track and lost the bike. Possible scenarios: failure at the throttle spindle potentiometer. Intermittent connector failure. Hot/toasted stepper motor on the throttle shaft, wiring failure on the stepper motor, CPU register stack errors,no end of ways to fail. I know, I designed robots with the same kinda stuff! IMHO he went wide due to the bike making power when not wanted. The guy is one of the best ever, I see no reason to doubt his view of what happened. Honda would never allow a rider to blame mechanical/engineering failures for a rider error. Not even Stoner. If they put the mic in front of Stoner, it records whatever he says. Honda may not have much say in that.. Without knowing more…………it looked like he went too wide into the corner and hit the dirt, thereby losing control of the front end. Knowing what really happened(out of control throttle) causes the same results. It’s too bad this ended up in a heap for Stoner. If there was any chance of him returning in any way to two wheeled racing I can’t imagine that this would have any kind of good outcome to encourage him to pursue further plans. Too bad, and too bad for Honda and their title defense. Nice of the Yamaha crew to win in such overwhelming fashion. Pol really earned some serious goodwill from his organization, I bet we’ll see it rewarded in MotoGP in some fashion. Throttle didn’t stick ! !He loss the front end and crashed..
It’s hard to be sure what bike the audio is coming from, but there is quite clearly a bike on the rev limiter right before his crash. wow,,,did not no that YOU were in the Honda pits and spoke with Stoners and his maechanics AFTER inspecting the crashed bike. You can clearly hear the bike bouncing off the Rev limiter after he pulled the clutch in…. Wrong. What happened was, you went so out of touch with reality again. Hondas head isn’t so big now is it!! Wow! Could have easily had a worse outcome.